My wife and I just recently joined a local food co-op. It's a kind of interesting way to get food, especially stuff grown and produced locally. We got our first share last saturday, and come sunday, I was looking it all over and trying to figure out what I could do with it. One of the meat things that came in our share was two racks of beef ribs, with four bones each. I was surprised just how big beef ribs are, compared to pork ribs (which is what most people barbecue). Anyway, I dug in and did some research, looking for a good recipe, and a good process. There were all kinds of methods: grilling, braising, baking, roasting. Some were a combination of two or three methods. One thing seemed consistent. The longer it takes to cook them, the more tender and delicious. So, today's ribs have been brought to you by "Low and Slow" cooking. Finally, after looking at all the options, my wife said, "Grandma Bev used to make the most delicious ribs with this Barbecue sauce based on brown sugar, catsup, and mustard. Why don't you try that?" In the interests of both nostalgia and simplicity, I decided to give it a try. What I came up with isn't much of a recipe in the traditional sense of the word. It's more of a set of instructions. You can make it work with the things you have on hand. And anything else you care to add in. Mushrooms would have tasted good, too, if I'd had any. I started out prepping the veggies, slicing them up, etc. I got some coals burning and poured a bunch out on my little Dutch Oven table. I put the dutch oven on the coals, with some olive oil (a couple of tablespoons) to heat up for sauteeing. Once the oil was hot and the veggies sliced, I put the two kinds of onions and the garlic in to sautee. I'd stir it from moment to moment, but at that point, I turned my attention to the sauce. I started with a bowl and put in about a cup of brown sugar. From that point on, I went simply by taste. I added some catsup and some mustard (about even amounts of each) and started tasting. It was weird tasting these condiments cold with nothing to put them on, but I was working out the proportions. In the end, I added more and more mustard. But then, I'm a big mustard fan. Salt brought out the other flavors, and pepper is just great to add to anything, in my opinion. The hot spice I added to just give it an edge. I just went along, adding and tasting, adding and tasting, until I got it to where I wanted it. And in between that, I was stirring the veggies. Once the sauce was mixed right, I poured about half of it into a ziplock baggie. I cut the ribs apart, and added the meat to the baggie. I shook it all up to coat the ribs. Back out on the dutch oven, I added the rest of the vegetables and then layered the meat on top. I adjusted the coals as above. These coals listed above are arranged in a baking configuration. You could probably also do a more roasting sort of arrangement by putting 10-11 coals on the bottom and the same amount on top. Remember that in this case, you'll be cooking with less heat for a longer time, so if you're going to make a mistake, make it on the lower side of the scale. From that point on, cooking was simply a matter of making sure that there were a constant supply of fresh coals to add on. I cooked the ribs for about 2 1/2 to 3 hours, in total. Wow, they tasted amazingly, fall-off-the-bone good. As I approach my birthday, I thought it would be a lot of fun to get a bunch of my dutch oven cooking friends together and have a gathering! For those that are uninitiated, the DOG (or "Dutch Oven Gathering") is an informal event where people who like to cook in the black pots get together and do so. They each cook up one or two pots of something, and everyone eats a bit of what each other cooked. It's all pot luck, if you'll pardon the obvious pun. So, as my dutch oven friends, all of you readers are invited. If you're in the vicinity of Eagle Mountain, UT on the 22nd of August (that's a Saturday), come on over! I'll soon be posting the details of the exact location (probably in a park nearby my home), and the time. We will likely begin to gather and cook at around 10:00 am, and start serving up food with a late lunch at around 2:00 or so. It is informal, and families are welcome to come (there's a playground at the park). Still, so that I can get an idea of who might show up, please RSVP in the comments here. Just for fun, you might also mention what dish you might like to cook! This morning, I got up and decided to make the swirled bread again, but this time to keep it away from the dog. I also decided to take more pictures. The only difference was that I didn't add any molasses this time, because I couldn't find it. Other than that, it was the same. Here's the bread dough, after it's been risen, rolled, and proofed. The coals are already on the lid, pre-heating, and it's almost ready to go. The richness of the two colors were much clearer this time. Like I've said before, I don't bake based on numbers of coals for a certain length of time. I do the coals for approximately 350-400 degrees, and then I just bake until the internal temperature is about 190-200. Once it has cooled, then it's time to slice it up and eat! Here, you can see the multi-color in the swirl. It was yummy, even though it wasn't as sweet (no molasses). I loved it, and so did my family. I made another attempt at swirled bread today. This time, I tried to do it differently. It tasted good, but it didn't swirl quite well enough for my satisfaction. Then my dog got to one of the loaf halves. I wasn't pleased! I actually made two loves, but the recipe I'm including here is for one. I started out with the hot water, and the honey. Yeast activates best in water that's at about 110 ºF. I just make it very hot, because when you add the honey, it will cool considerably. 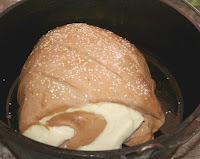 Then, I added the yeast, and let that sit to foam up while I gathered the other ingredients. I mixed everything in the second set into the the bowl with the first set, and just stirred it all up with the old wooden spoon. When I'm mixing at this stage, I tend to go with less flour, and I tend to add more in the kneading process. With it all stirred up into a gloppy goo, I separated them into two equal batches. Into one, to be the dark swirl, I added all of the third set ingredients. Then, i kneaded each batch separately, adding more flour as I went to keep it from sticking, and going until each one passed the windowpane test. Then I set each one aside to raise. In about an hour to an hour and a half, they were ready. The dark one raised more, I think because of the extra sugar in the molasses. Once they'd risen, I rolled each one out flat and shaped them into squares. I put one on top of the other, like stacking paper. I rolled them up, and then kind of mushed the ends toward the middle so it was a little more ball shaped. I put that into the oiled dutch oven to proof. While it was proofing, I lit up some coals. Once the coals were lit, I put about 20-25 coals on top of the lid, to pre-heat it. By the time that the lid was heated, the bread was nicely risen in the dutch oven. I coated the loaf in the beaten egg, to give it a nice sheen on top. I took it outside, made a ring of coals and put the lid on, with the proper amount of coals. From there, I just replenished the coals as necessary, and turned the lid and the oven every 15 minutes or so. I baked it to an internal temperature of 190-200º. Then, I took off the lid and brought the dutch oven in to cool and let the bread cool with it. We served it up with the dinner my wife's cousin brought over. Yummy! Last weekend, Jodi gave me this recipe for a really simple pulled pork roast that turned out really good. I tried to do some cool sides along with it, but they didn't turn out as well. Actually, the potatoes did, but the rice and beans, not so much. I had a lot of things I was trying to do in addition to cooking, and it just didn't do too well. The recipe was originally for a crock pot, so I modded it a bit for dutch oven, but not really too much. I started by putting the spices in the first set on the roasts and rubbing them in a bit. Then I put them in the 12" deep dutch oven and roasted them. I pretty much went with a "low and slow" approach to the heat. I kept the coals replenished, but always on the low side of the counts. I wanted it to take a longer time to cook, and just to take it easy. I actually roasted for about 3 hours. When the thermometer said they were done, they looked really, really good just as they were. I thought about just slicing and serving them as is. But I pulled them out and shredded them with the fork. I put them back into the pot. In retrospect, I probably would've removed about half of the liquid that was at the bottom of the dutch oven first. Not all of it, but some. It did end up a bit gloppy and I had to add some flour to thicken it up at the end. I put the dutch oven back out on the coals, but this time in more of a baking configuration, with more heat on top. I added all of the ingredients in the second set. Actually, those marked with the * were not included. I thought about those later, as I was eating it. "Wow, this is really good! It would've been even better with...*" So, if you make this recipe, I recommend you try those ideas. The potatoes were really cool. There are some dishes you do fancy things to that make it taste better, and then there are some dishes you do fancy things to because it simply looks better. This one, really, is both. I got the idea from Medium Rare, Please. He's a fun blogger to read, 'cause he takes a lot of pictures along the way as he's cooking. So, these are basically just seasoned baked potatoes, but with a twist. You slice them, thin, most of the way through. Then, you slide some garlic slices in between some of the potato slices. Finally, you coat the potatoes in olive oil, and sprinkle on spices. He suggested black and white sesame seeds. I couldn't find any of those, but I thought I'd choose my spices as much for color as taste. So, I did salt and pepper, of course, as well as white sesame seeds, then for a bit more black, I did poppy seeds. Finally, for a touch of red, some paprika. The rice and beans... Well, we won't talk about those until I can pull them off... But really, with the meat and the potatoes, some veggies would have gone better anyway, and maybe some tortillas. Just a thought... I need to learn more about menu planning. I have a bit of a problem with the word "Gourmet". It kinda comes across as a bit of snobbery. In a lot of ways, that's kinda contradictory to the spirit of the dutch oven. a "Dutch Oven Gourmet" is almost an oxymoron. On the other hand, perhaps a better word to describe it is a dichotomy. A see a good example of what I mean, go to the IDOS World Championship Cook-Off and take a look around at what you see. You'll seen untrained chefs, talking to each other in a "good ole boy" kinda drawl. Instead of the formal chef toque, many are wearing cowboy hats. Instead of the double-breasted shirts of the restaurant, you'll see bandanas and bolo ties. And you definitely won't see any professional ovens or stoves. And yet, the food prepared that day is world-class, five-star food. So, what defines "Gourmet"? Well, that's a lot like asking what defines "Fine Art". It really is in the palate of the taster. I finally felt like I got a decent boule loaf of french bread! I made my own fettuccini and a really tasty creamy herb sauce. I learned how to make a good cheese sauce for my chicken cordon bleu. I overcame my childhood hatred of asparagus with this salmon dish. Handmade Tortellini with sausage and alfredo! Cornish hens are just classy food! I love the taste of cajun spices. Here's blackened salmon on veggie rice. This penne rustica is possibly the best pasta dish I ever made! One of my more exotic efforts was this Russian coulibiac. Delicious! And for sheer fanciness and simplicity, you can't beat steamed crab on rice! Another one of my overseas delights was this attempt at Indian cuisine. Now, here's my pathetic plea for comments and link love: What's the most exotic/fancy/bizarre thing you've ever cooked (dutch oven or not)? A corollary to that is: What's the most exotic/fancy/bizarre thing you've ever eaten (and lived to tell about)? Would you ever eat it again? My wife teases me a lot, too, because I can't seem to leave things alone. I like to cook from scratch as much as possible, and I love to "kick it up a notch", just to see if I can. But sometimes, I end up overdoing it and there are just too many flavors all competing for attention in your mouth. While I do like to make some pretty fancy stuff, I also very much enjoy "One Pot Meals" and things that you can whip together with whatever you have on hand. The easy dutch oven recipe is delicious not only because it's so flexible and so adaptable, but also because there are lots of delicious flavors in simplicity, too. Anyway, I've been noticing a lot lately that people are often looking for less elaborate recipes to cook in their dutch ovens. The ones I've selected below are some of my favorites from the Black Pot. They're all delicious, and are easy dutch oven recipes to assemble and cook. Chicken wrapped in Bacon Sooo, sooo goooood! Potatoes and Chicken Easy and flexible! Chili, with ideas for variations You can't go wrong with Chili, make it how you like it! A Great Beef Stew A standard comfort food. Steamed Rice and Crabs Legs Easy can be fancy, too! Mountain Man Breakfast A story of a cry for help that turns out well. BBQ Ribs - They take a while, but they're worth the wait! Carne Asada with a roasted veggie salsa! You can't get your Dutch oven card until you've done a Dump Cake Cobbler! Irish Soda Bread. If you follow these instructions, it will be easy! Simple corn on the cob. Meatballs and Potatoes: Easy and impressive at the same time. Black Pot Goulash. Something different! Dutch oven Heat! Counting out the coals. Do you have any easy dutch oven recipes you'd like to add to this list? Just post me a comment! 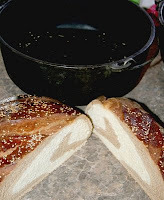 Dutch Oven Bread Tips - A New Squidoo Lens! How long should I knead it? How can I tell if it's done? Why doesn't it get all big and poofy, like it does in my regular oven? It's good stuff, so check it out!